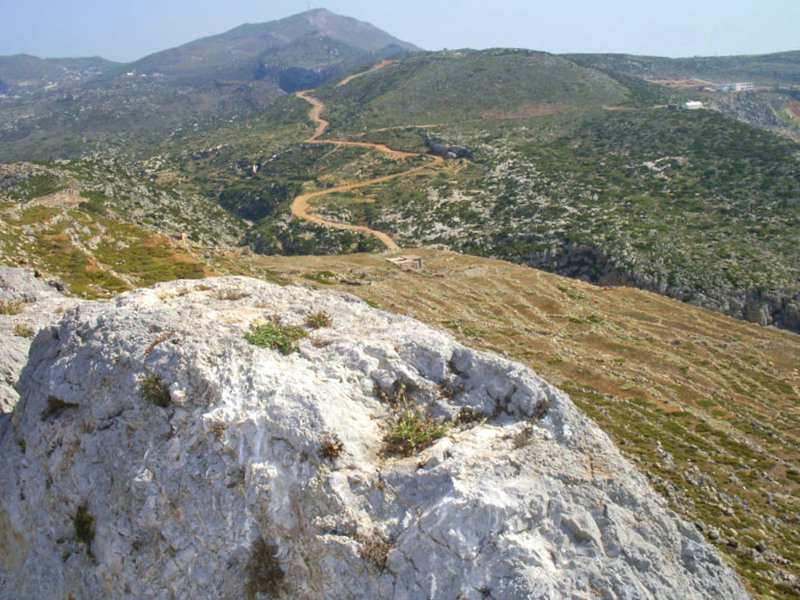 Less than 1km north of the junction at Aroniadika, a road (subsequently unmade) leads northeast across a plateau to *Palaiochora (4km). 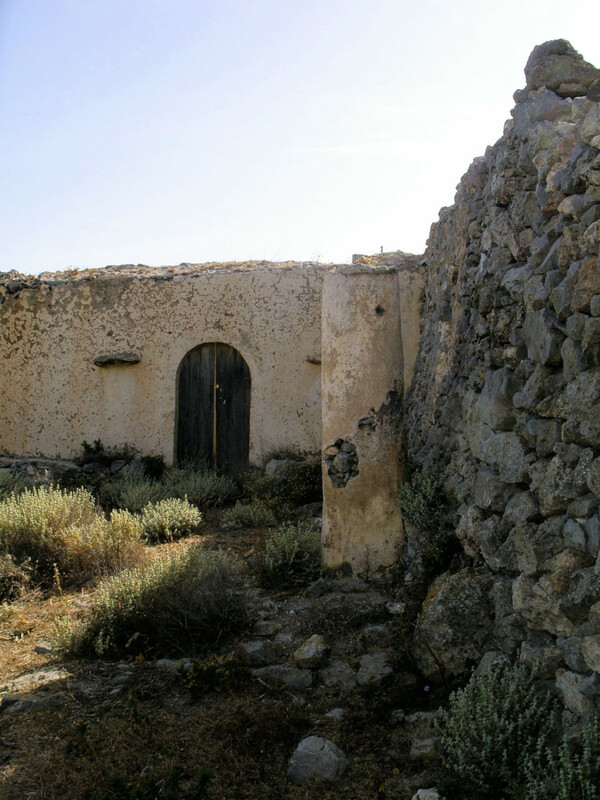 The setting of this deserted Byzantine settlement is courageous, magnificent and unexpected. 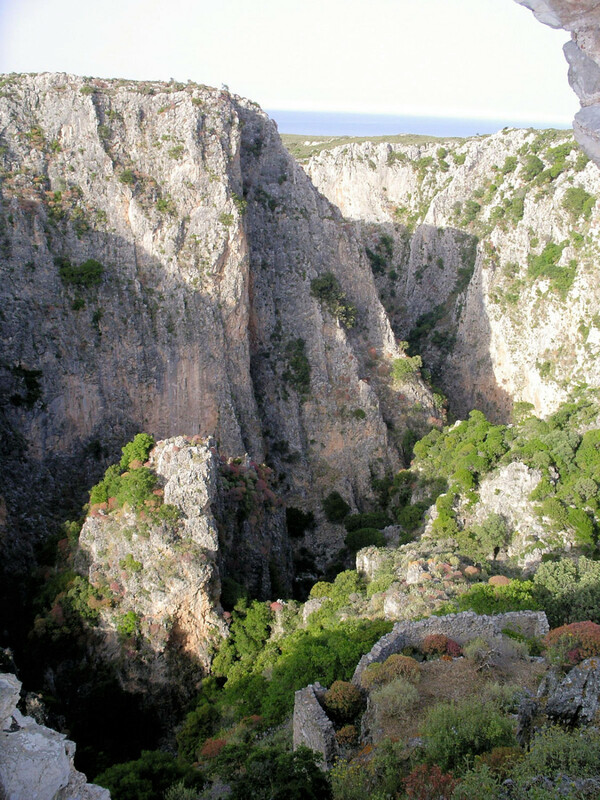 Much of the interior of Kythera is on an undulating plateau; at this point, however, a number of streams have carved precipitous ravines which have their confluence here, plummeting 250m to the sea below, through the gorge of Kaki Langada (or ‘evil defile’). 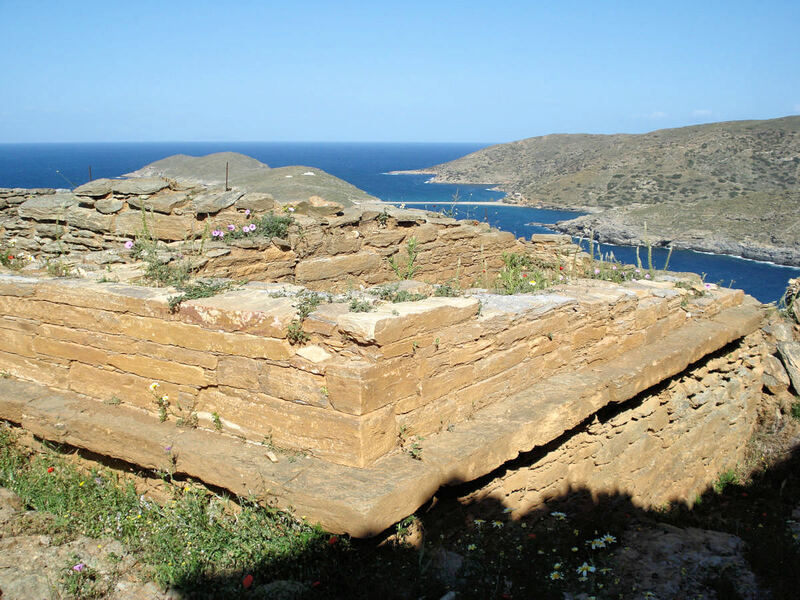 The fortress and settlement of Palaiochora clings to a central dividing spur of the gorge. 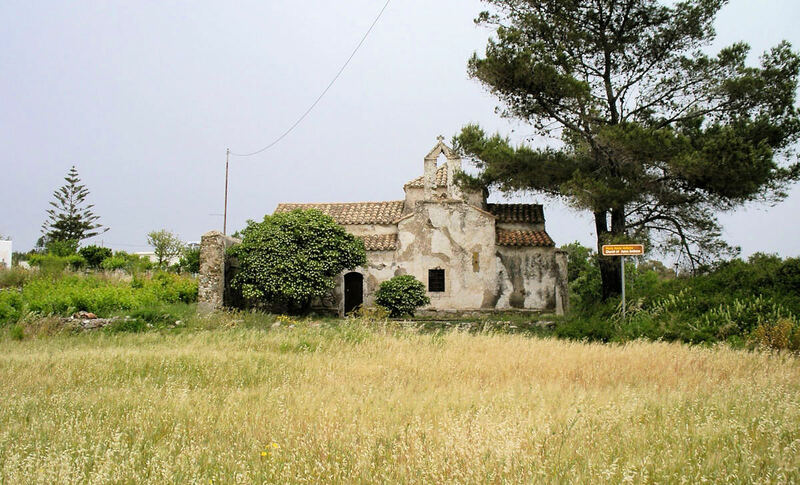 The few remaining and abandoned churches are built precariously over vertiginous drops; the vigorous vegetation is colourful in all seasons, the aroma of wild oregano overwhelming, and, if the wind is still, the only sound is of echoing bird-song and the omnipresent buzz of bees. 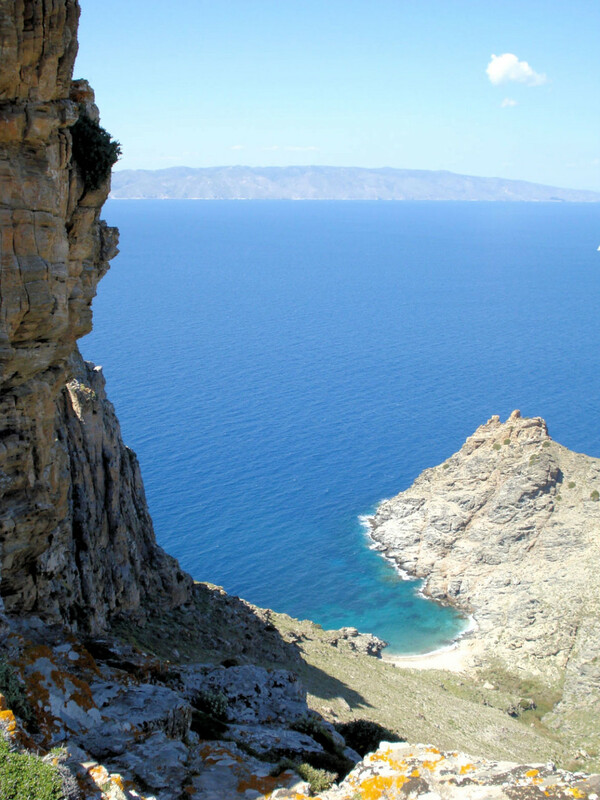 The view extends across the sea to Cape Malea and the Peloponnesian mainland. 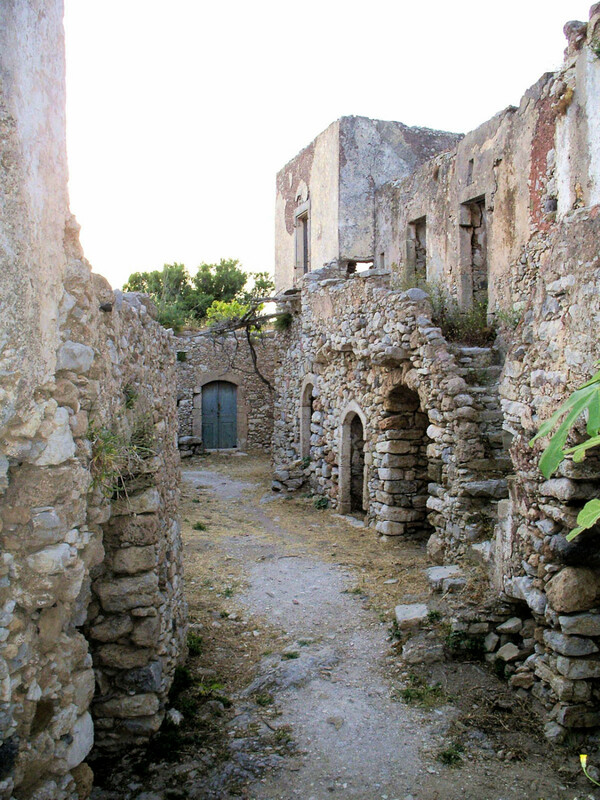 In the foregound as you approach, and all around, are the remains of (what was then called) the town of Aghios Demetrios, the hidden and seemingly impregnable capital of the island from the 13th century through until its complete destruction by the Turkish admiral Khaireddin Barbarossa in 1537. 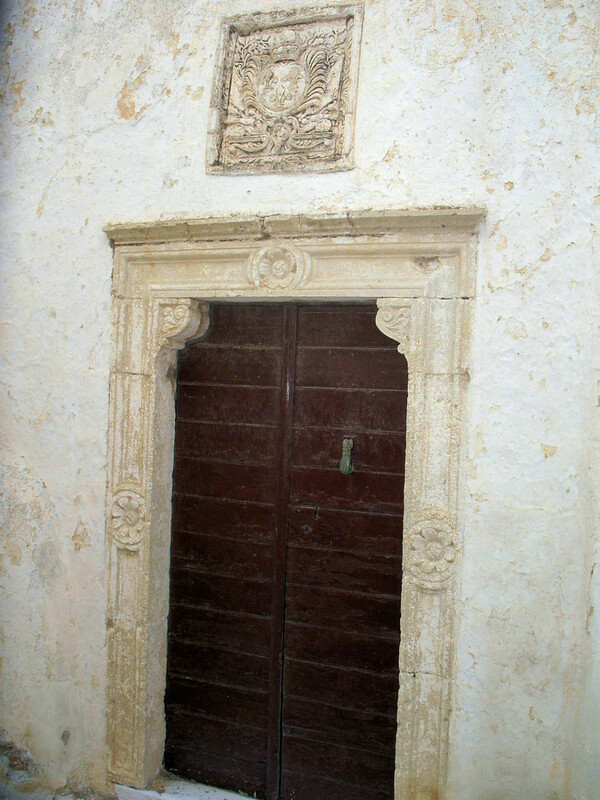 (Of the three churches here which still have their roof and walls complete, and which are often kept locked, one alone (Aghios Antonios) has some remaining decoration in the interior. 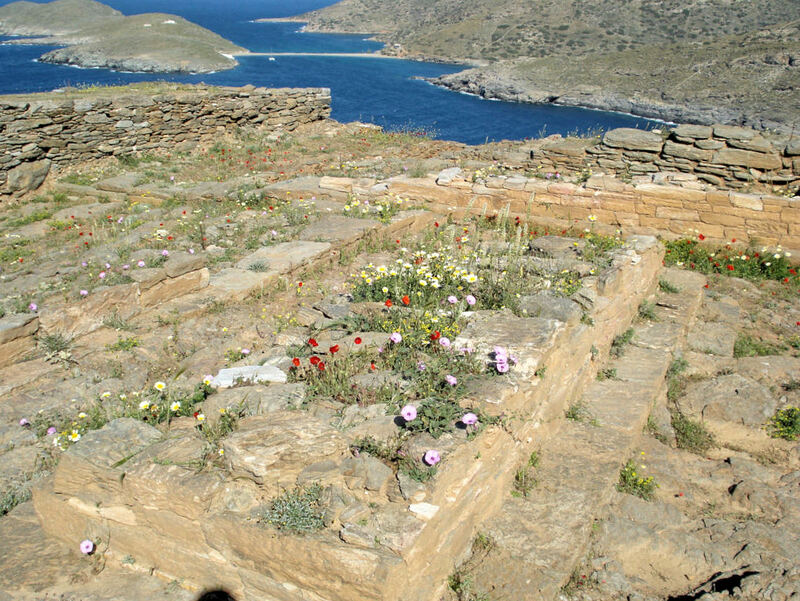 Only someone with specialist interest need take the trouble to obtain the key from the Archaeological Office in Livadi, should the buildings all be locked: the beauty of the setting and the ruins outweighs the interest of these interiors.) 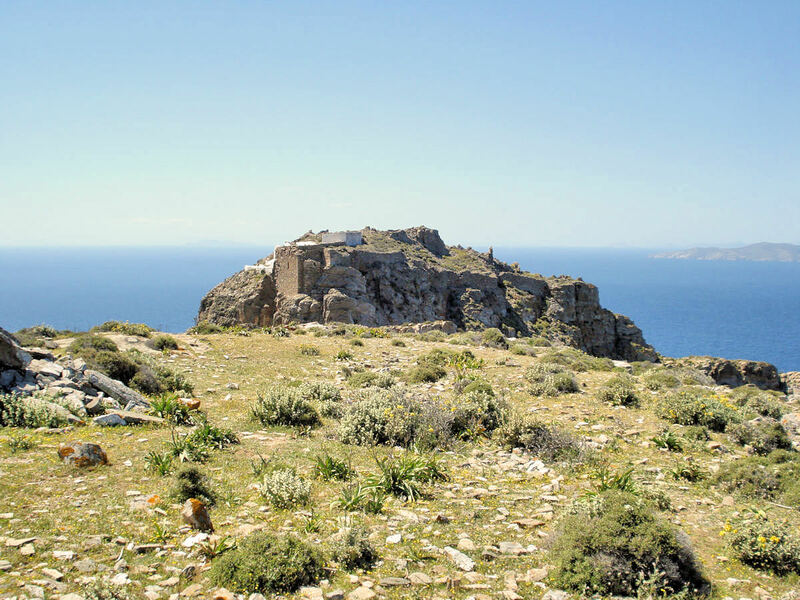 Just below the path and to its north is the beautiful free-cruciform profile of the church of Aghia Barbara, with its high octagonal drum and cupola still intact and roofed with irregular slabs of schist, and its three symmetrical facetted apses. The bare interior has an unexpected spaciousness in spite of its small size, perhaps because it is free of any piers supporting the dome, which here sits firmly on the corners of the crossing. Both viewed from outside and in its inside, this is a perfect exam ple of the best 13th century Byzantine, church architecture. 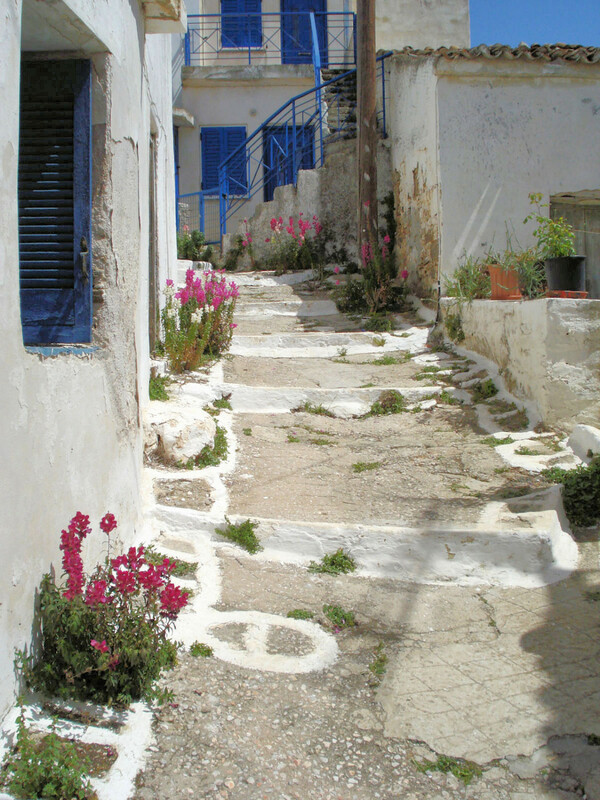 The path descends to a saddle which gives access to the fortified ‘acropolis’ of the city. To the left is the church of the Panaghia tou Forou (still in use), with a masonry templon screen and a somewhat dissonant modern roof. 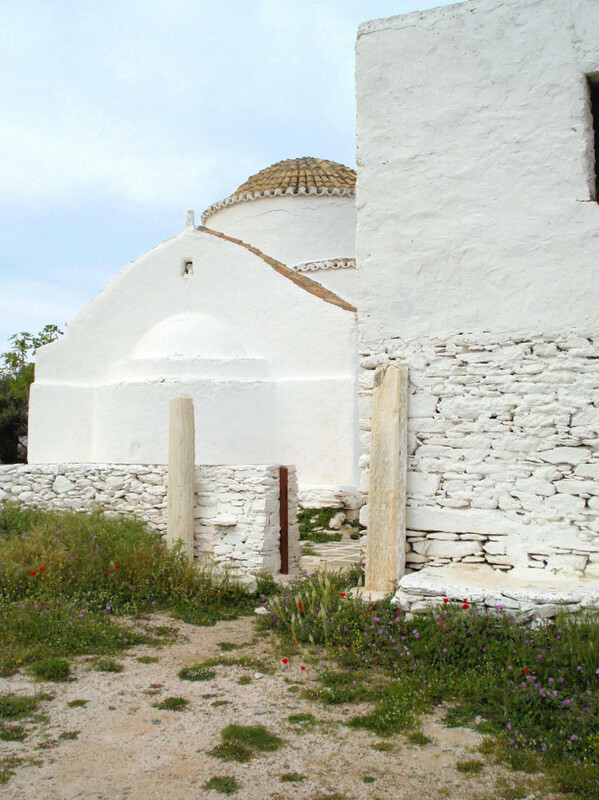 Further in, and just below the walls of the main fortification, is the late 15th century church of Aghios Antonios, with a belfry and elegant ogival door-frame on the north side, which leads into a very irregularly shaped ante-chapel, before giving onto the main naos. 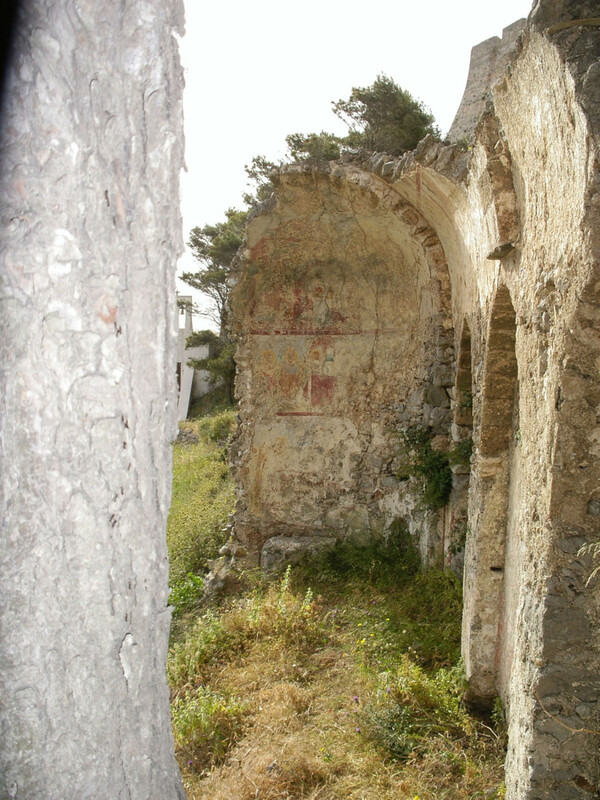 The apse of the church (as can be seen from the outside) is on the verge of collapsing; some of the paintings (a 16th century St Catherine) have been removed to safety and are now on exhibition in the church/museum of the Analipsis in Kato Livadi (see above). Those that re main are in a condition as precarious as the church itself. The masonry templon screen is decorated with fluted pilasters, and bears vestiges of painting, with a very faint kneeling Donor figure at the lower north corner. 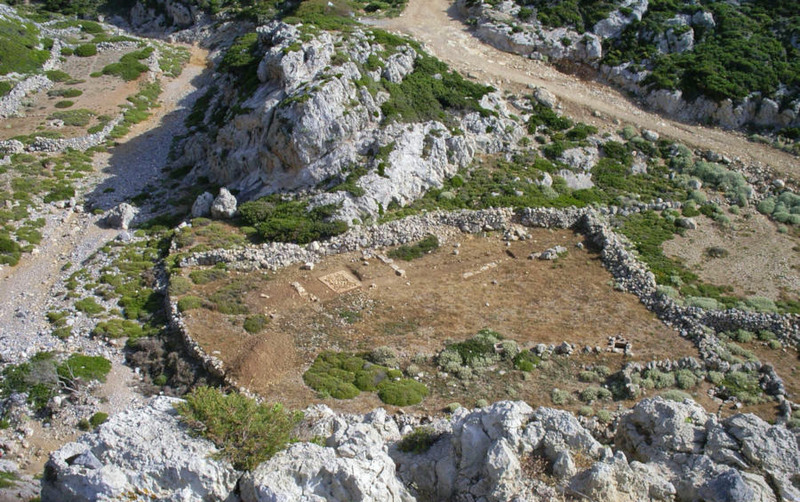 The keep-gate, just above Aghios Antonios, is not easy to discern: most of the settlement’s defence, in any case, lay in the natural site more than in massive walls. 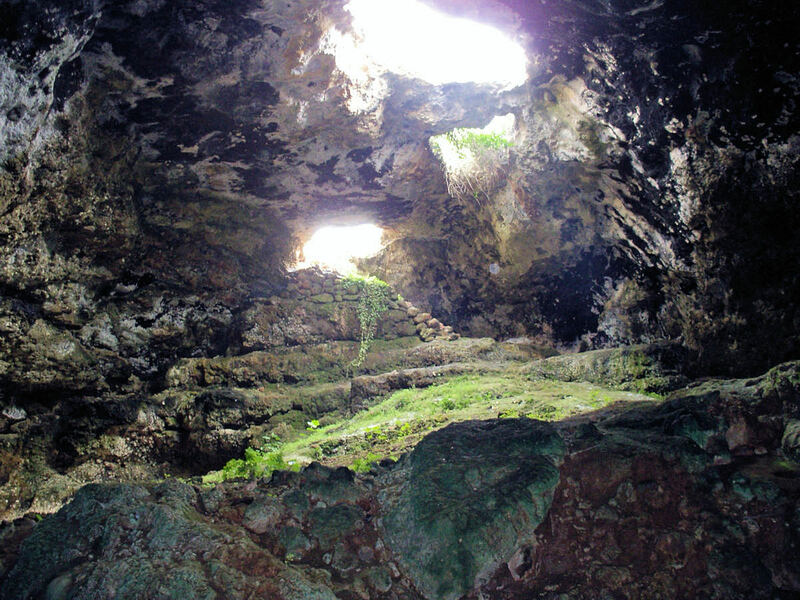 On all sides around the fortified spur, over a dozen churches have been identified, several of them hanging from the cliff-edge. 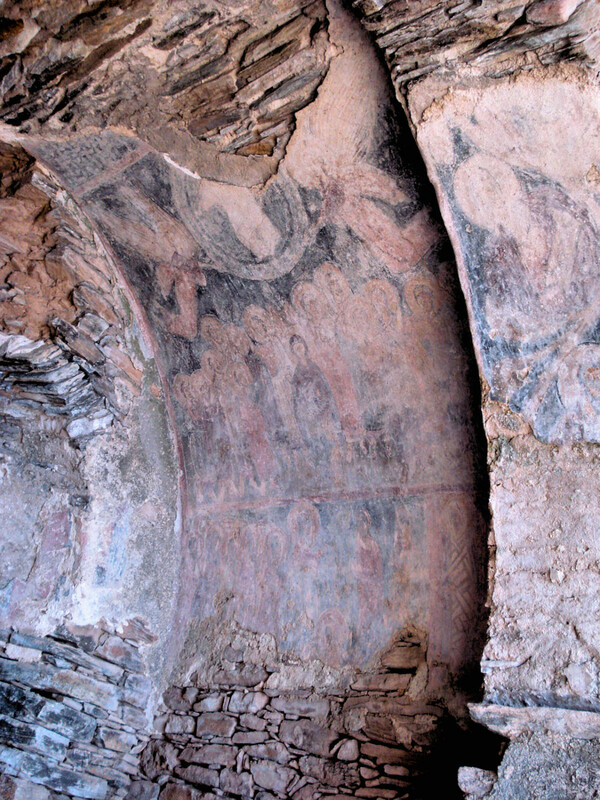 Al most at the peak of the hill is a larger, roofless church of the 14th century which still bears some fast-vanishing paintings in situ, and is believed to be dedicated to the city’s patron, Aghios Demetrios. Just to the east, the land drops below the walls in a sheer fall into the gorge. 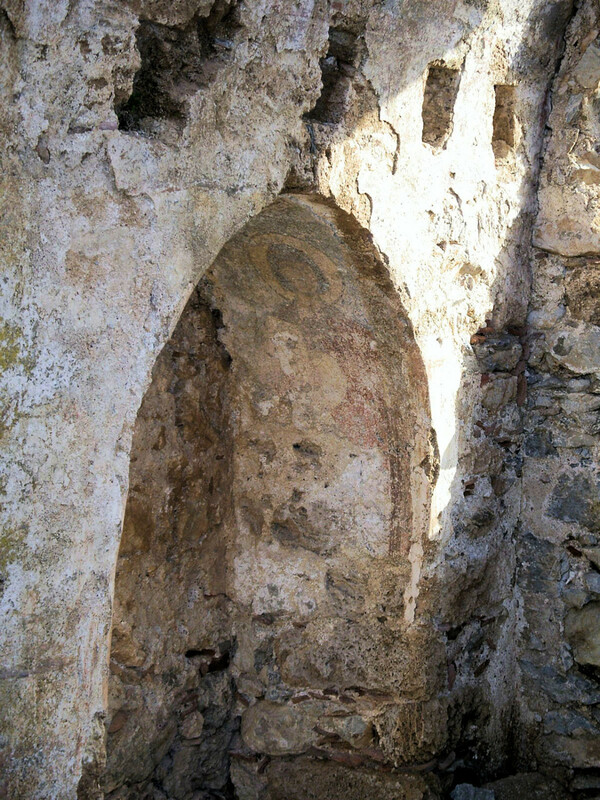 Further round, to the north side, a long barrel-vaulted chapel (possibly dedicated to the Taxiarchis Michai―l) has slightly better preserved 15th century paintings in its vault. The best wall-paintings from each of these two churches have now been detached and are on show in the museum of the Analipsis. 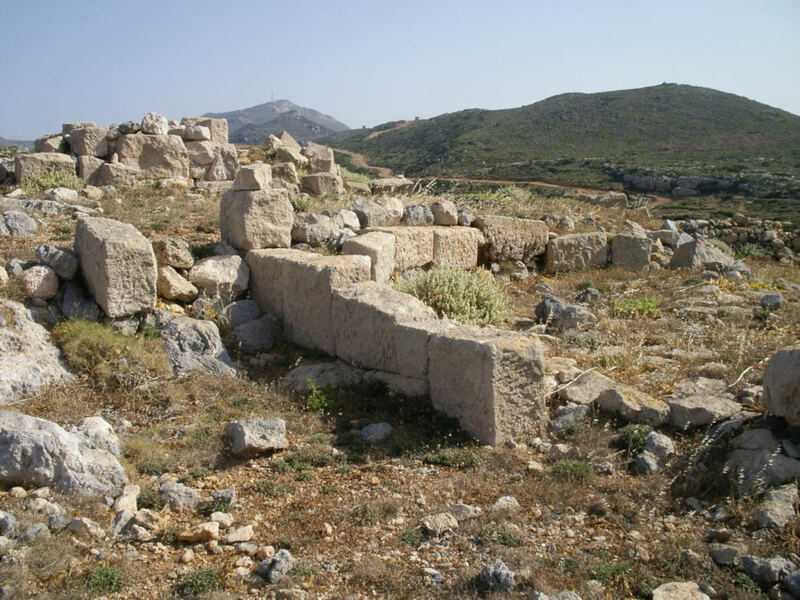 Few houses are visible at Palaiochora, but the extant remains of some larger civil buildings may be seen just to the east of the Panaghia tou Forou. 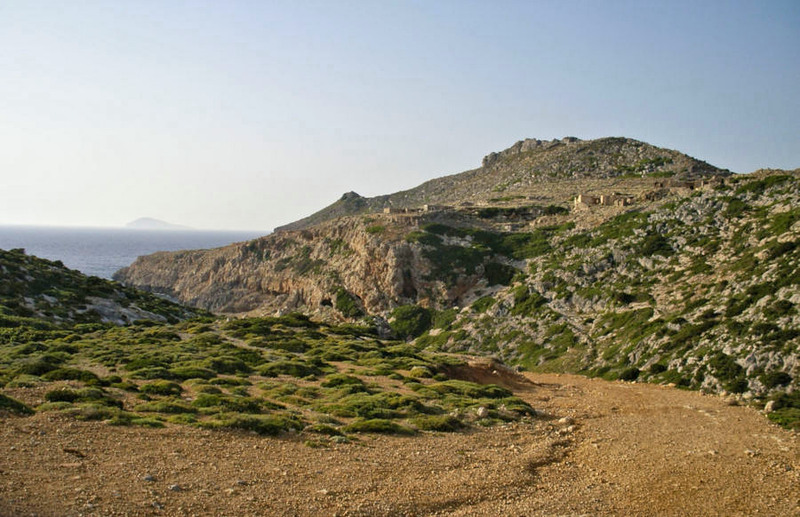 Returning to the main north/south road and heading 500m further north beyond the turn for Palaiochora, a small road-side oratory marks a left turn (west) to the monastery of Aghios Theodoros (300m), containing the relics of the 10th century spiritual father, Theodore of Kythera, who left the mainland, settled on Kythera and died here. 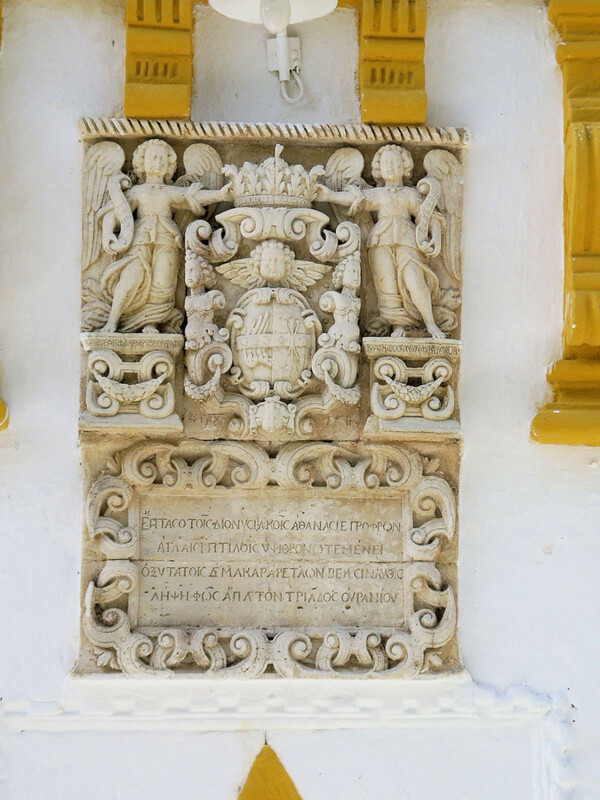 The spotless façade of the catholicon is dominated by an intricate and heavily carved escutcheon in high relief—a particularly fine, southern Italian work of the early 17th century. There are angels with scrolls holding a crown above the elaborately framed coat of arms. The minute inscription below the feet of the right-hand angel refers to a certain lord (bishop) Athanasios, whose arms these may be. Sadly, a late 19th century restoration of the interior of the catholicon has left the original 13th century foundation all but invisible, except in its form and in the presence of a damaged fresco at the north end of the templon screen. In the northwest corner of the church is the reliquary of St Theodore. The elegant and imposing building to the north of the façade of the church was built by the British in the early 19th century as a school. 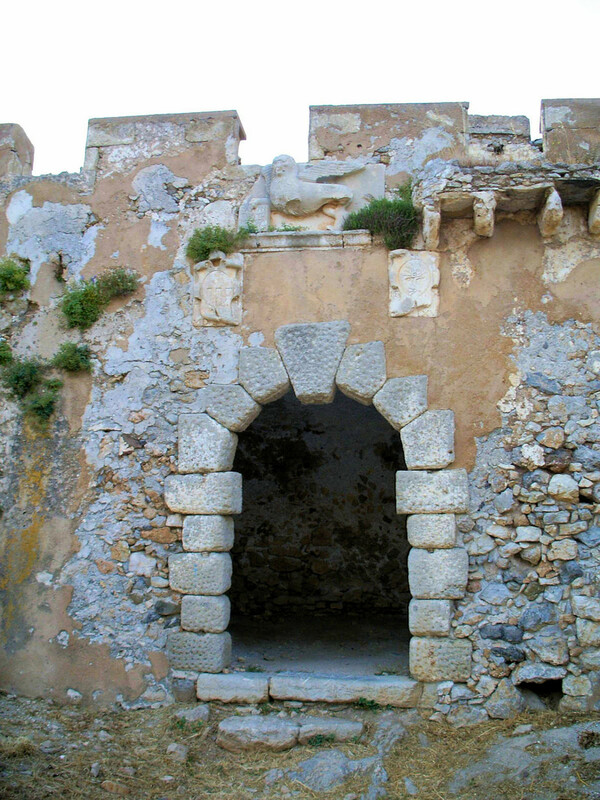 It is one of several on the island, all of which are different and are not without architectural merit. A further 500m to the north beyond the junction by the oratory on the main road, the solitary profile of the 12th century church of Aghios Nikon is visible in a field to the right (east), containing patchy remains of wall-paintings, mainly in the squinches of its low and irregular cupola, and in its two unsymmetrical apses of different sizes. Even the base of the (now dismantled) templon screen is not perpendicular to the (unparallel) walls. 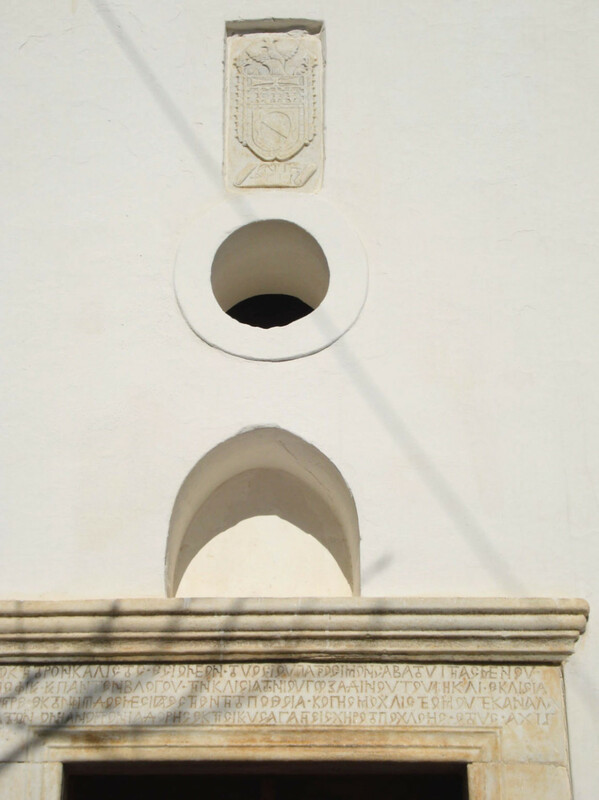 The tiny church is a hymn to the Byzantine love of irregularity. Almost opposite Aghios Nikon, a road leads off the main road to the west, towards the village of Perlengianika (1.5km). Here, on a slope at a little distance to the south of the road, are two churches, not contiguous but linked by the remains of a square tower which once stood between them. 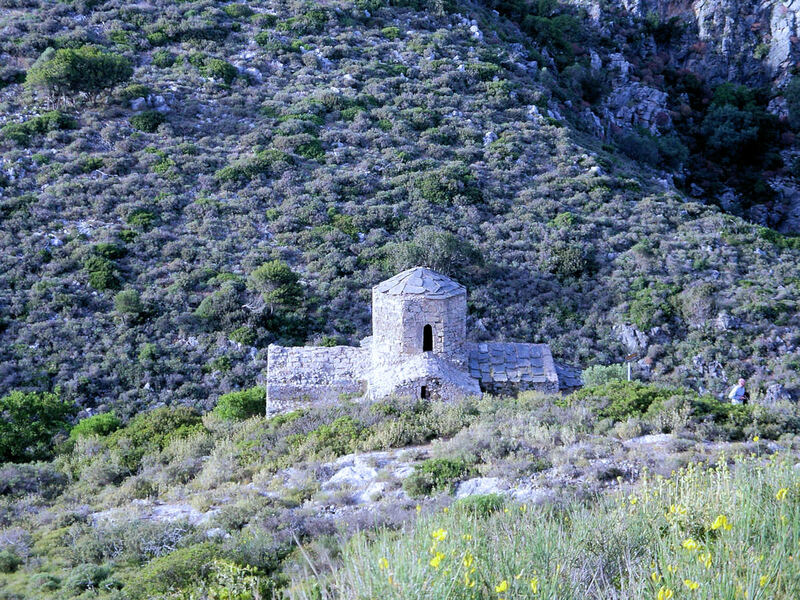 The north church of Aghios Andreas is of the late 14th century; the tower and the south church of Aghios Giorgios are nearly a century later. The area covered by wall-paintings in both churches is consider able, but their condition is poor. 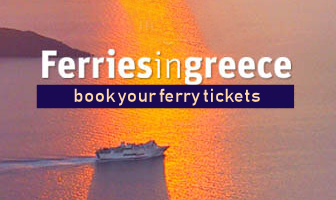 This is due to mineral efflorescences which make the pictures hard to read. Most visible of all is a striking scene in Aghios Andreas of the Entry into Jerusalem, in the vault of the naos . The extraordinary and amusing hats and robes of the little children strewing and collecting palms do not detract from the magnificent presence of the Christ figure against a deep, night-blue background. 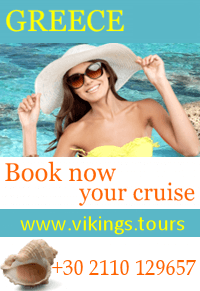 Many of the villages in this area—Aloizianika, Zaglianikianika, Pitsinades, and especially Trifyllianika— have interesting vernacular architecture of the 17th and 18th centuries, and are a pleasure to explore on foot. 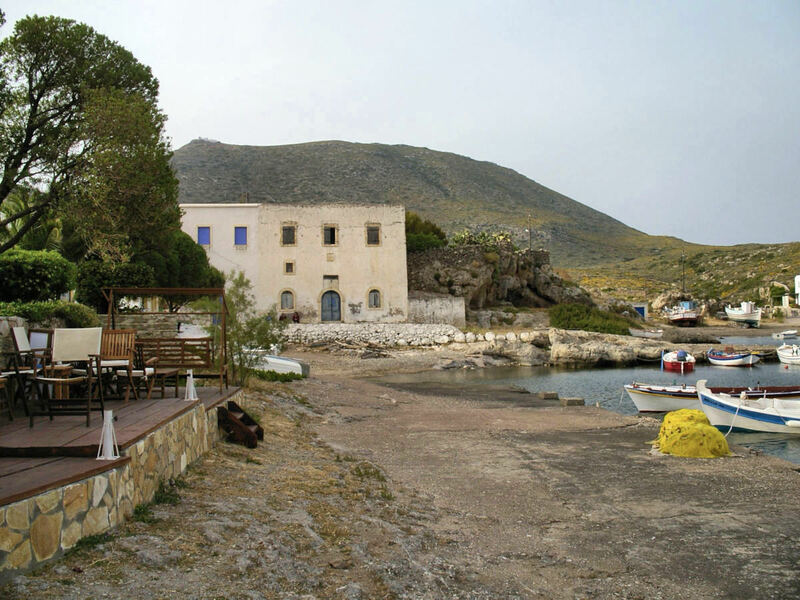 Their principal point of reference is Potamos (2km north of Aghios Nikon), the capital of the north of the island. 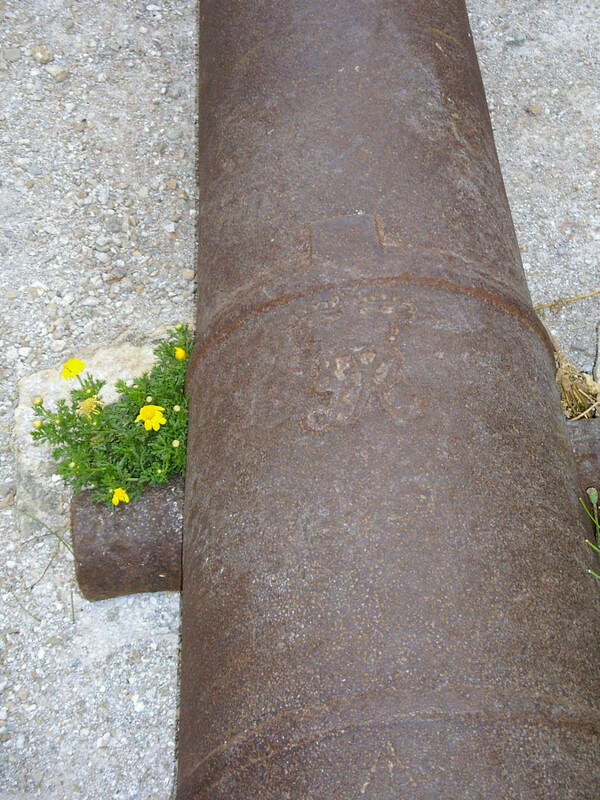 Sufficiently far inland to have avoided the less penetrating depredations of pirates and marauders, and sufficiently far north to have a distant similarity to the southern Peloponnesian villages across the water, Potamos is also quite different in appearance from Chora: there is less the feel of the ‘island bastion’ here. 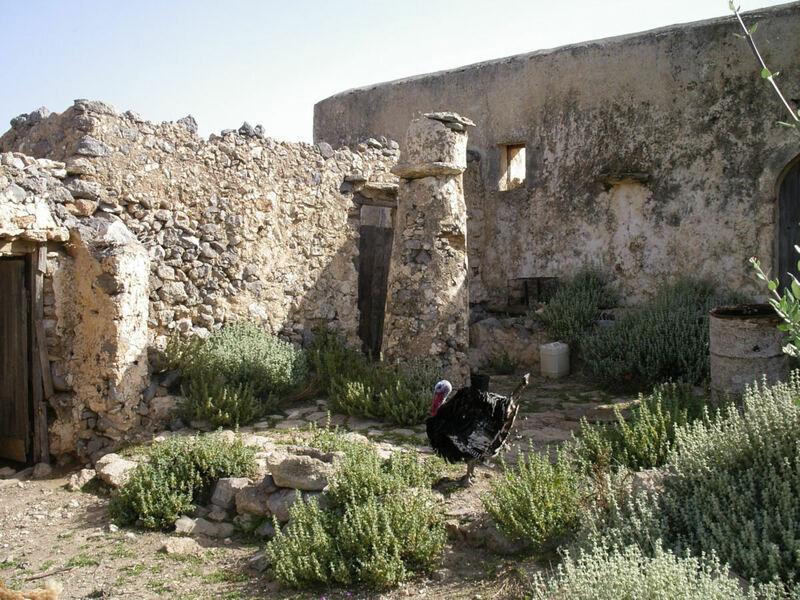 The presence of a number of 13th and 14th century churches in the vicinity, shows that Potamos was substantially inhabited at the same time as Palaiochora, to which its citizens would have moved when it was necessary to seek protection and refuge in times of danger. 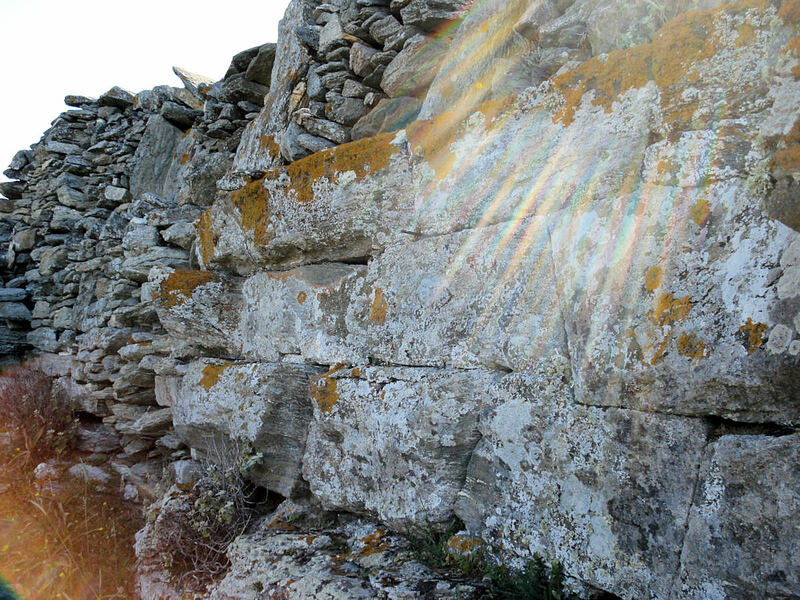 But the recent (1990) discovery of Early Christian floor-mosaic fragments in the dilapidated 13th century church of Aghios Ioannis, near the village’s cemetery, has suggested that the settlement here is far older, going as far back as the 6th century perhaps. 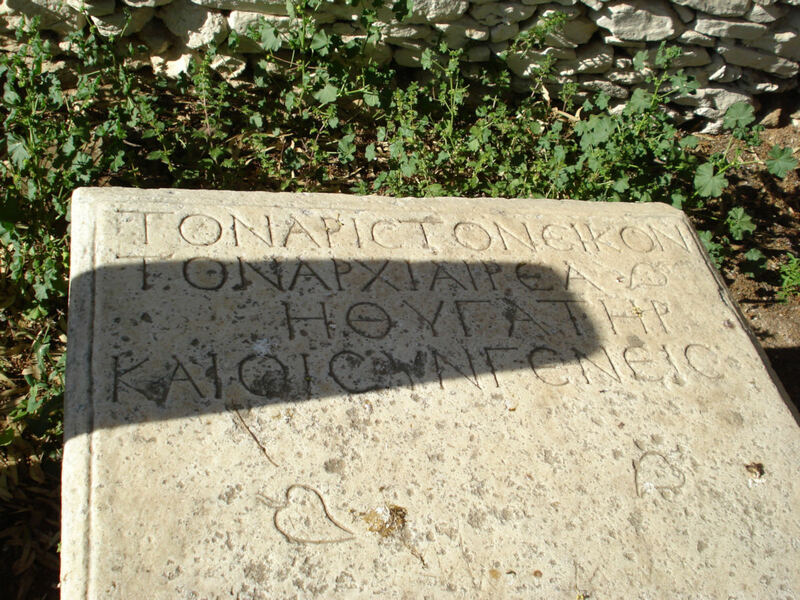 (The mosaic is now in the church/museum of the Analipsis in Kato Livadi.) 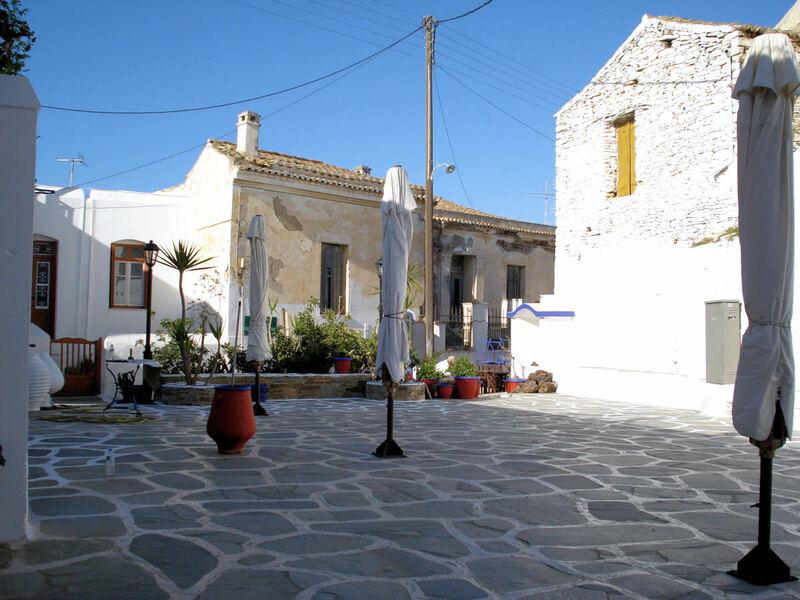 Today Potamos is a thriving and pleasant village, more lively than beautiful, with a number of large neoclassical houses which possess grand airs, but rather lack a proper context. 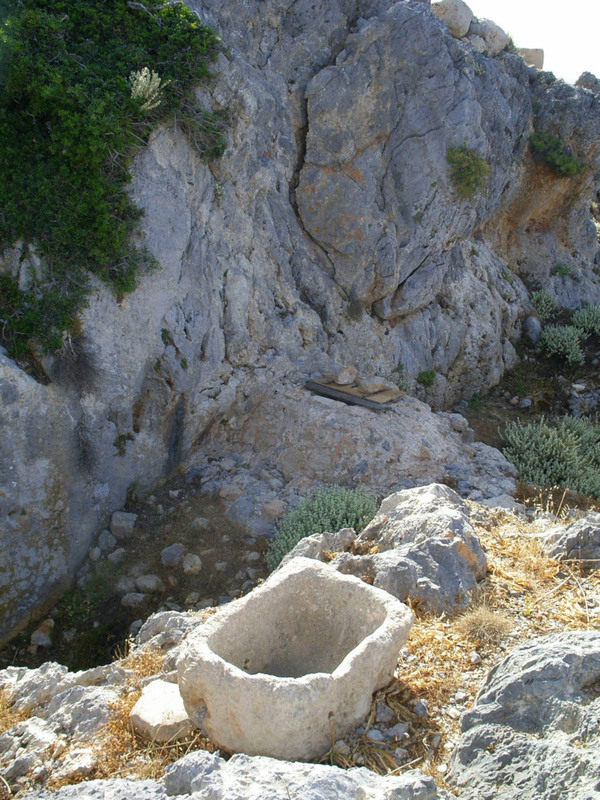 To the north of Potamos, the road passes into more fer tile land at the northern extremity of the island, descend after 8km into a well-watered valley at Karavas. 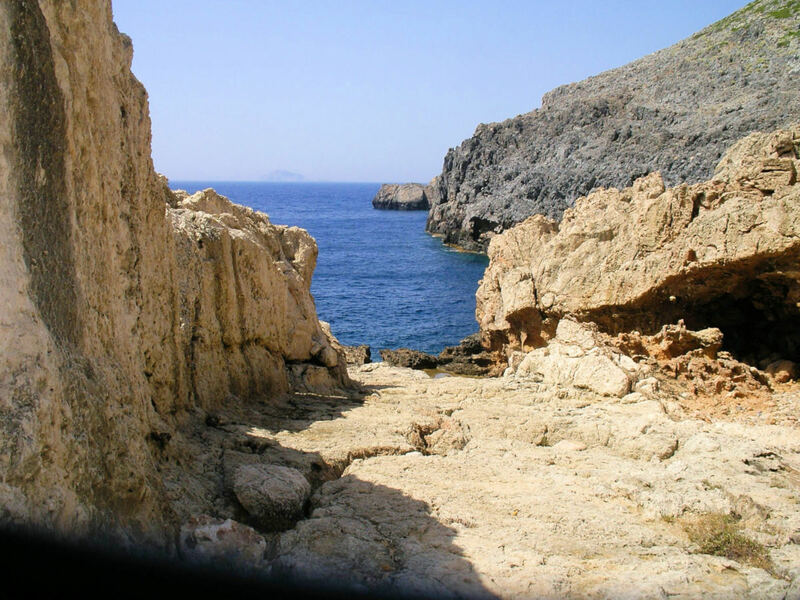 The beauty of the springs here can best be appreciated at Amir Ali (a strange Turkification of the Venetian word ‘Ammiraglio’, referring perhaps to an admiral who resided in the vicinity): a well-signposted, narrow road leads down here from Karavas. 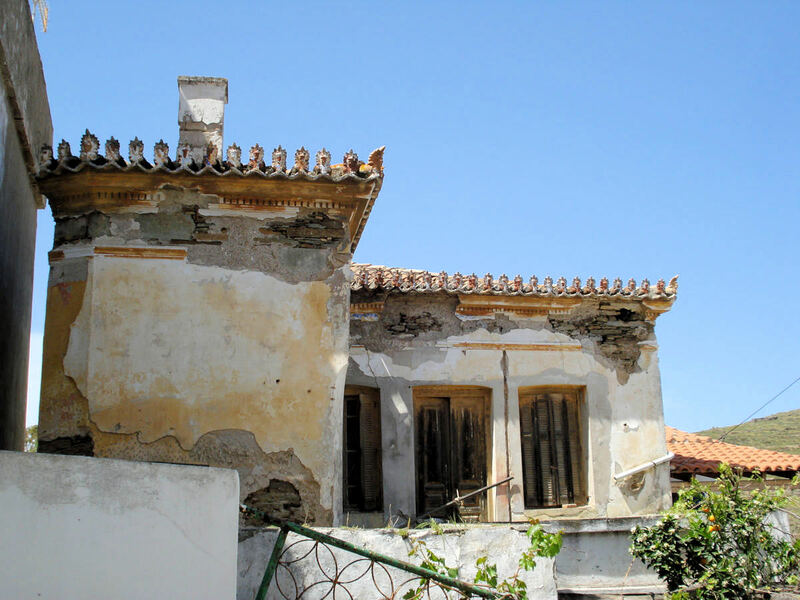 There are plentiful springs, plane trees, a cafe and an ensemble of pleasing 18th and 19th century houses—some inhabited, some in ruins. 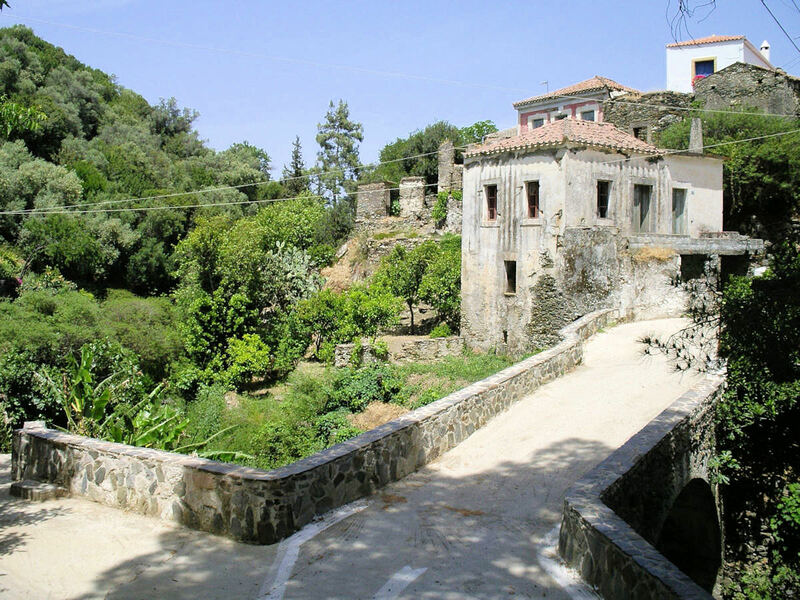 At Mavrogiorgianika, on the hillside above, are more examples of the local architecture of the same period—simple, square, well-proportioned houses with low-pitched roofs, similar to those in the southern Peloponnese. 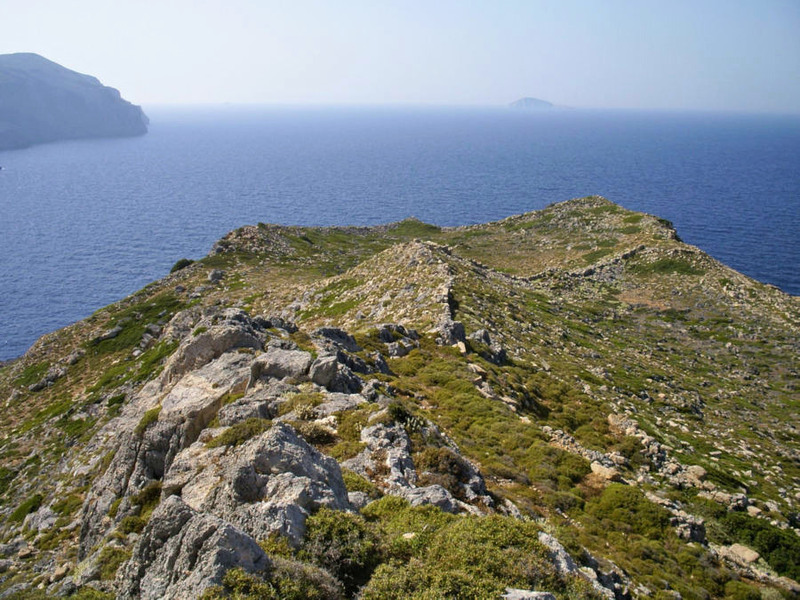 A 4km walk with fine views, north from Mavrogiorgianika, brings you to the early 19th century lighthouse at Moudari, built by the British: this marks the northern extremity of the island. 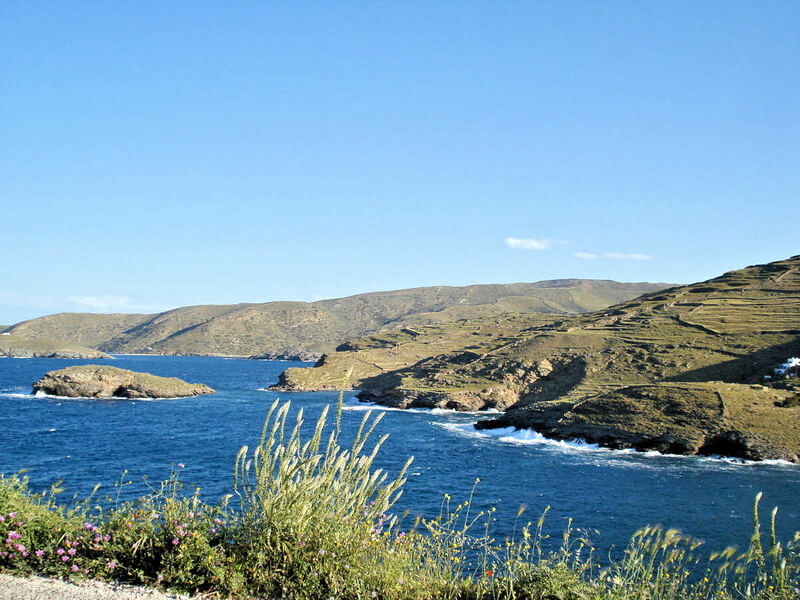 The northern branch of the asphalt road ends 3.5km beyond Karavas at Platia Ammos, a small seaside resort with beach: the south eastern branch leads back to Aghia Pelaghia (5km), which was formerly the main port of the island up until the opening of the new harbour at Diakofti. 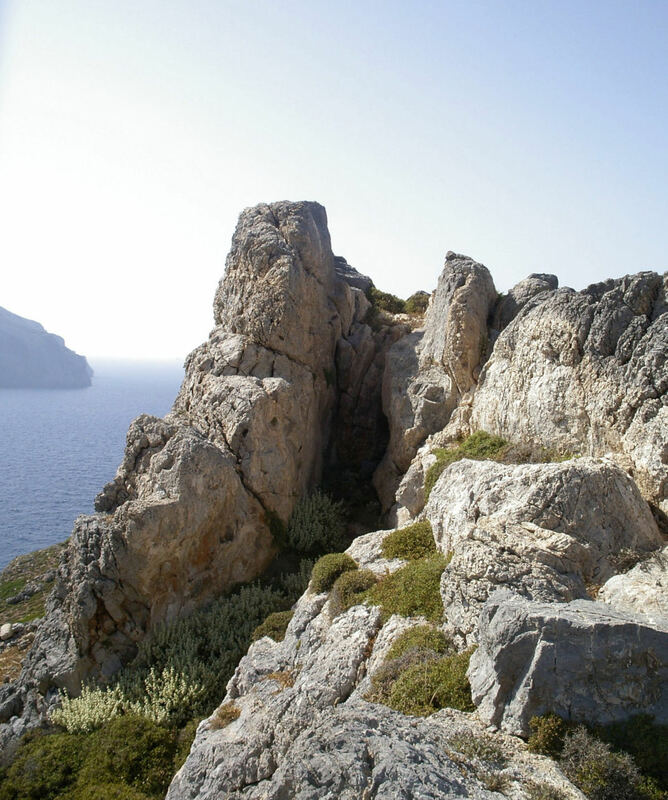 Following the coast line to the south, and continuing once it becomes a track for a further 2km, you come to the seaward outlet of the Kaki Langada gorge which descends from Palaiochora, at Limni where the track terminates below cliffs rising 200m above. A bar of pebbles blocks the freshwater descending from the gorge and forms a small pool at the narrow exit. There are small colonies of samphire on the cliffs, with only marginally less flavour than the famous Chiot samphire. The gorge, viewed from here, is impressive; but it can only be entered if you are prepared to wade some distance. 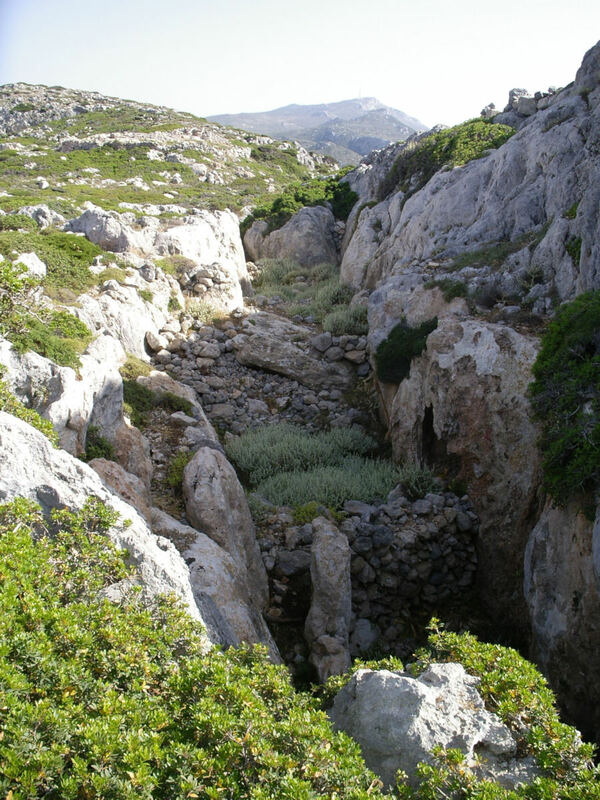 The main road south from Aghia Pelaghia climbs rap idly, passing another small cave-church dedicated to Aghia Sophia, and, slightly higher up, the Spring of Galani. It then levels out on a plateau, thick with pine woods. 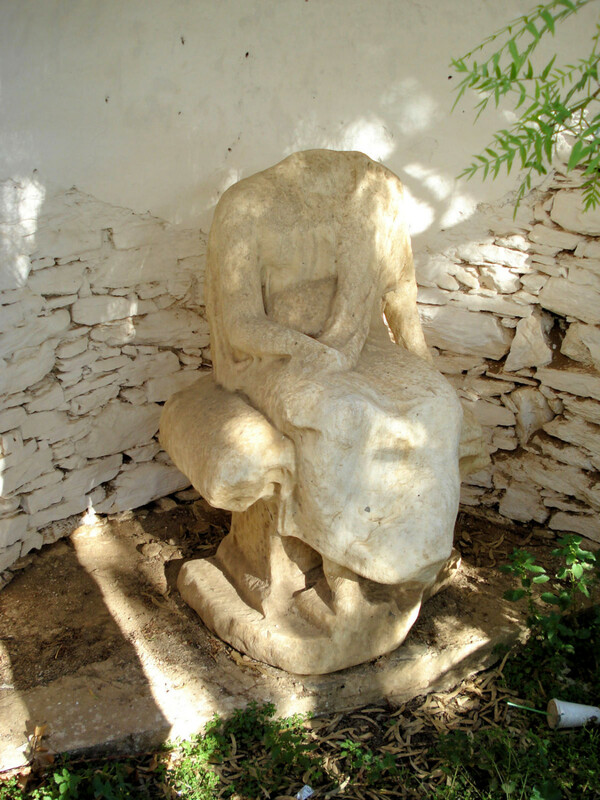 Five and a half kilometres from Aghia Pelaghia and less than 1km from Potamos, to the right (north) of the road and isolated in a field, is the 13th century, double-church of Aghia Kyriaki­, which in the apse of its south chapel has four large painted faces of saints—among them Aghia Kyriaki­ herself. 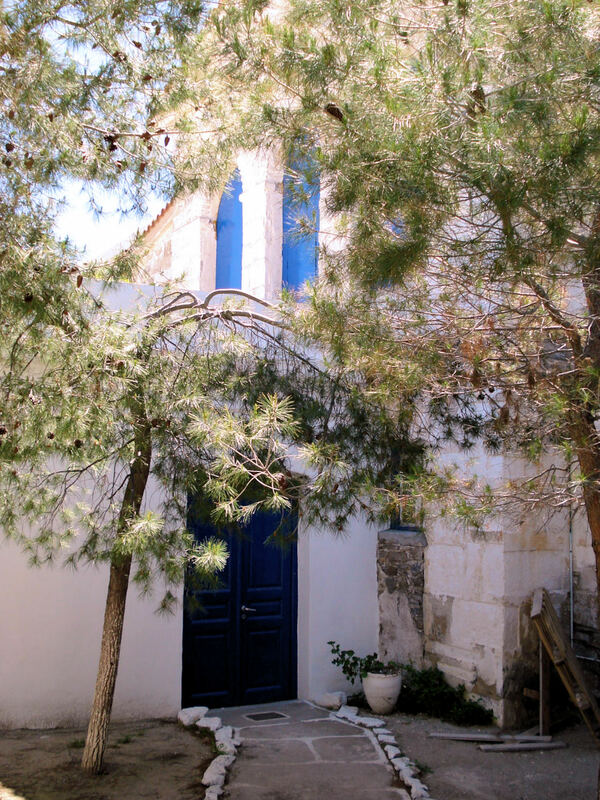 At the same point on the main road, a sign indicates a track leading 200m right (south) to the church of Aghios Ioannis in the pine woods. This is another double church of later date (15th century), with fragments of painting inside. 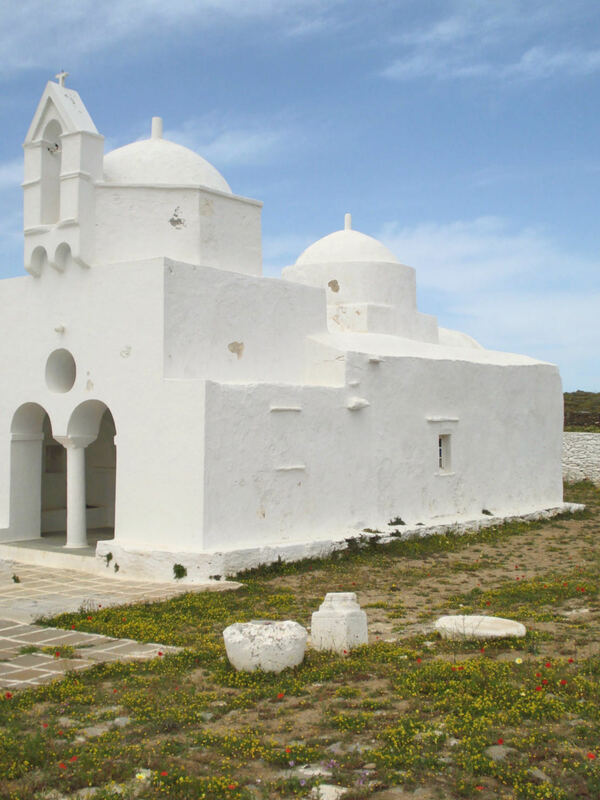 The frequent occurrence of double or twin churches on the island is the result of demographic changes. 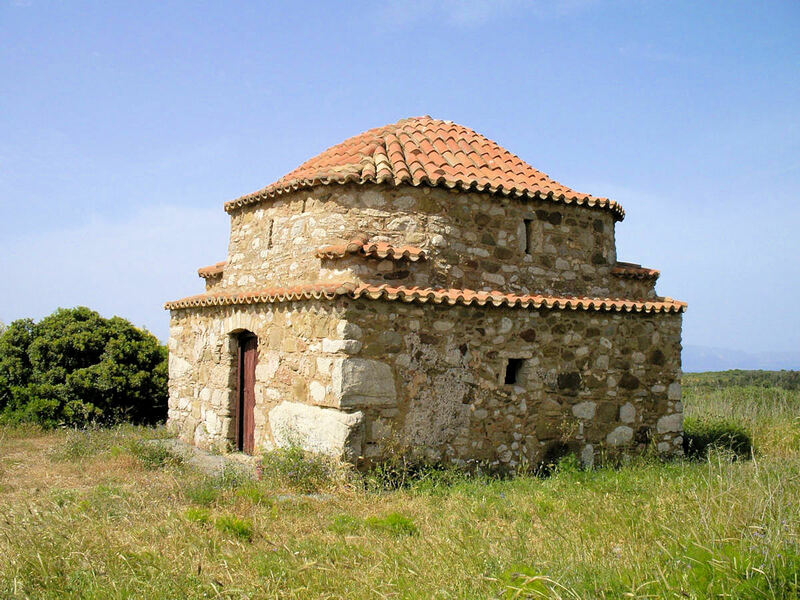 The earliest rural churches are largely tiny structures; and in periods of relative stability (e.g. before the devastations of Barbarossa in 1537 and again in the mid 17th century) when the population notably increased, rather than pull down an often beautifully decorated church and build something bigger, a parallel church would be added to one side in order to accommodate the larger congregation. Just as you enter Potamos once again, the road passes over another of the stone bridges built by John MacPhail in the 1830s under the British administration, similar in design to the much larger viaduct at Katouni (see p. 46), but this time more beautiful—its central arch wider than the others and unexpectedly decorated with fine carved swags of fruit and foliage. 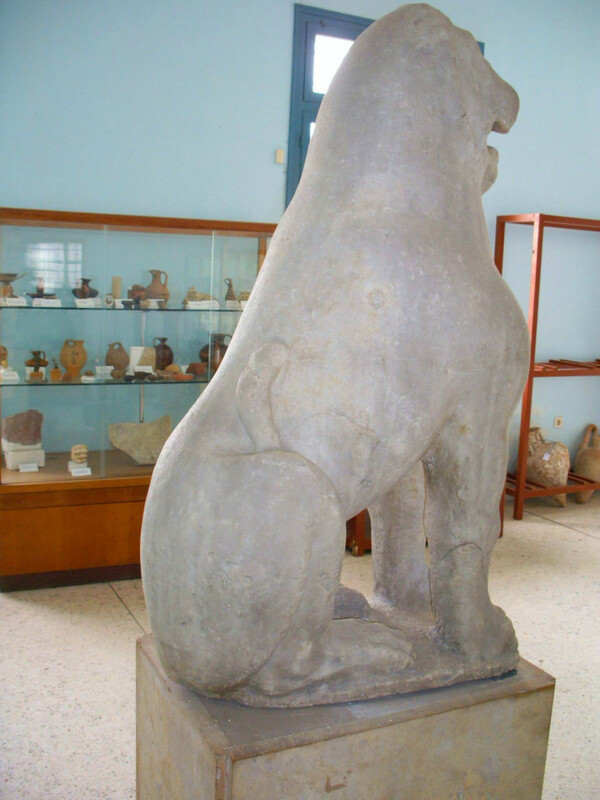 Four kilometres south of Potamos, the road returns to the central junction at Aroniadika, where the itinerary began.